Transform eCommerce from a business expense to a business advantage. Find out how in a free white paper from Acumatica. Adding eCommerce to your business requires an investment of time and money. Most companies find that it’s “worth it” in terms of cost savings. But their analysis ends there—and they miss out on the real benefits of eCommerce. You can use the web to do so much more than sell products quickly and cheaply. 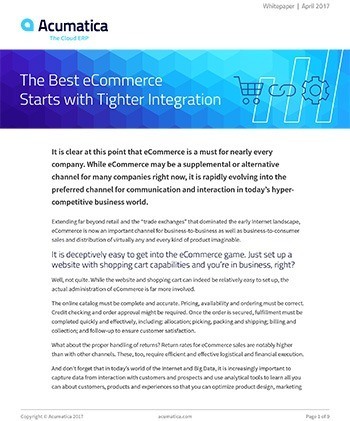 By tightly integrating eCommerce with the rest of your business, you can provide a seamless customer experience that your competitors simply can’t match. Find out how in a new white paper from Acumatica. Avoid building a “same old, same old” eCommerce business. Build a business case that convinces your colleagues to invest a robust integration to your back end systems. Make more repeat sales, and support them with efficient fulfillment. Establish a single hub for all transactions in all channels. Hone your eCommerce strategy for lasting success. Just complete the form, and you’ll be able to download this whitepaper in seconds. Acumatica Cloud xRP Platform, Acumatica’s platform-as-a-service offering, delivers value due to its ease of use and flexibility.